Inside the Fake News Bubble? 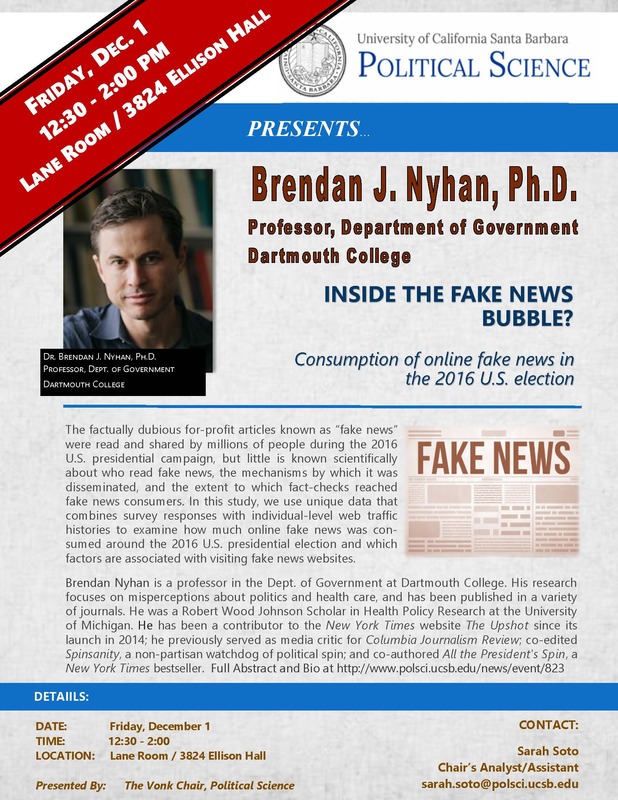 Brendan J. Nyhan is a professor in the Department of Government at Dartmouth College. His research, which focuses on misperceptions about politics and health care, has been published in journals including the American Journal of Political Science, British Journal of Political Science, Journal of Politics, Medical Care, Pediatrics, Political Analysis, Political Behavior, Political Psychology, Social Networks, and Vaccine. Before coming to Dartmouth, he was a Robert Wood Johnson Scholar in Health Policy Research at the University of Michigan. Nyhan has also been a contributor to the New York Times website, The Upshot, since its launch in 2014. He previously served as media critic for Columbia Journalism Review; co-edited Spinsanity, a non-partisan watchdog of political spin that was syndicated in Salon and the Philadelphia Inquirer; and co-authored All the President's Spin, a New York Times bestseller that Amazon named one of the ten best political books of the year in 2004. The factually dubious for-profit articles known as “fake news” were read and shared by millions of people during the 2016 U.S. presidential campaign, but little is known scientifically about who read fake news, the mechanisms by which it was disseminated, and the extent to which fact-checks reached fake news consumers. In this study, we use unique data that combines survey responses with individual-level web traffic histories to examine how much online fake news was consumed around the 2016 U.S. presidential election and which factors are associated with visiting fake news websites.